I'm not sure what money you "lost", of course, but I suspect that you are referring to the trial exchange that always takes place when you register a new payment method. Linden Lab issues an authorization request to the credit agency -- temporarily creating an entry that looks like a charge on your account. The credit agency then reverses the operation to verify that the payment method is able to both send and receive money. As the note in the Knowledge Base says: "At no time is the US$1.00 actually charged, though the authorization may appear on a credit card statement as such. The amount may show as "pending" or "authorized" for a few days, but then will drop off the account entirely. " This is a standard verification process used by many businesses. The situation is somewhat different when you try to use a debit card, because debit cards are generally not acceptable as payment methods. In that case, the credit agency cannot send its verification message, so the payment method will not be registered. It's my understanding that the "pending" authorization note in your credit account will still remain for a few days but will disappear after a while because no money was actually transferred. The only way to be sure whether this is true is to wait and few days and see what happens. If the charge is still there, then call the LL Billing Office. Debit cards don't work as a billing method in the majority of cases. You need a credit card, paypal or skrill. The easiest way is connect your bank account with paypal and keep a balance in your paypal account to pay for SL. Thanks for the tip. I'll try to bind a PayPal account and will close the topic if all goes well. By the way what can I do with the money that I lost in failed attempts ? Not sure I understand, if you weren't able to add the card how could it charge you money? That's how it works. The fact that this card was already linked and worked properly. 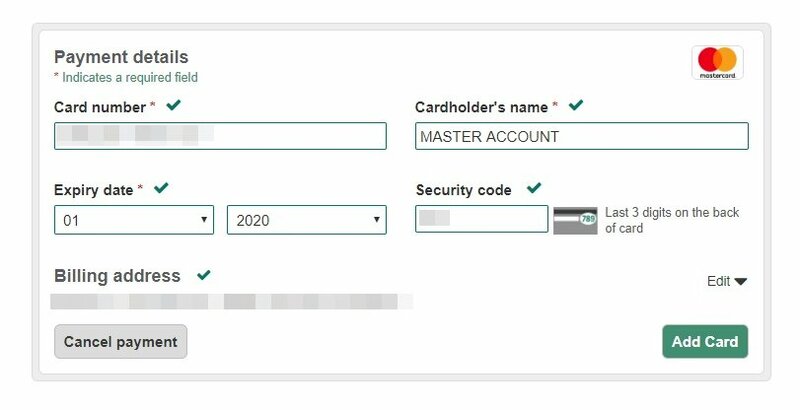 And now I have entered correctly all my data, click "Add card" and the process is loading and about not reaching the middle, I have an error, which I wrote in the beginning, while the money is debited from the card at the same time. It seems that the only way to solve this problem is to call on the phone, because it is impossible to do it through messages (unfortunately I have very bad English for a call). Thanks for trying to help, but it doesn't seem to make any sense. Well, let's step through this again. Debit cards are not accepted as a payment method. SOME debit cards have worked in the past, but when you go to re-register them or update them, they will fail. Any time you try to register a new payment method, LL makes a trial charge-and-refund of $1.00 to the card. This may show up as a charge on your card, but it will be reversed in a day or two. You haven't lost any money. If there are any other charges that appear on the card besides these test transactions, you should call LL Billing.